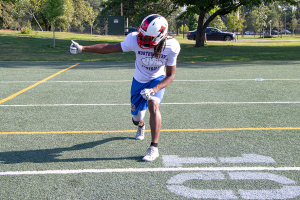 He knows violent gangs offer his West Side players a pass as they trek through bullet-riddled cityscape hauling their football pads to and from practice, while they dream of a life outside of Chicago. D’Angelo Dereef and his coaching staff at Al Raby high school on the city’s West Side are more than coaches. Their players say their leadership means everything to their chances of educational and life success. The program’s impact has resulted in scholar athletes going to college and top talent drafted into the NFL. 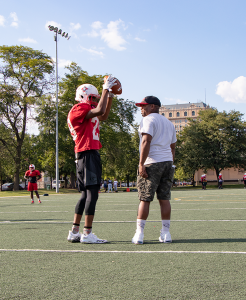 Dereef, coach at Al Raby since 2004, believes if his program builds successful young men first, the product on the field will take care of itself. In 2018, Al Raby’s staff watched proudly as one of their own not only played for and graduated from the University of Indiana, but also was selected in the 6th round of the 2018 NFL Draft. In 2017, Dereef marched his program to a 12-2 record and to its first state semi-final appearance. More impressive though, 68 college recruiters came to visit Al Raby players that year, the coach said, and seven out of 11 seniors signed college intent letters to play football. As many as 11 of 17 of Al Raby seniors this past 2018 season will go to college to play football on some level, with two commitments to Division I programs already despite a down year at 5-6, said Dereef. 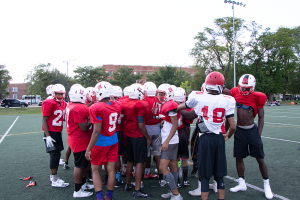 What makes this even more impressive is that less than 400 students are enrolled at Al Raby, and the team only fields an average of 24 to 30 players each season. The average Chicago Public Schools high school has an enrollment of almost 900 students, according to the CPS website. “I don’t know where I’d be if it wasn’t for Al Raby,” Covington said. This scholastic and athletic feat is accomplished with “unwavering discipline,” players explained. Not just the hard stuff, either, but discipline coupled with love, acceptance and consistency according to Dereef. Each player is expected to achieve a point total derived from off-season program participation like weights, team meetings and academic requirements. Failure to do so means a player does not dress in the fall. The team also can’t afford to go to spring and summer camps, so the coaches bring the experience to them. Every training camp starts with the “lock in.” The team spends a week sealed inside the school, living in the gymnasium, bonding together and earning the final points needed to make the team. Dereef also has a special eye on academics to help ensure his team is achieving his expectations. 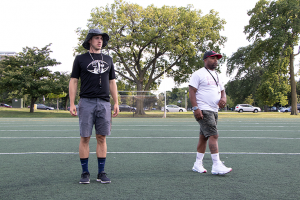 Part of the success is also attributed to the partnership and consistent presence of its coaching staff, especially from one former Wheaton College football player who adds experience coupled with ministry, said Dereef. Jordan Dornbush, defensive coordinator and the West Side’s representative for the Fellowship of Christian Athletes, is in his fourth season volunteering at Al Raby. His dedication is enormous for a student population who expect men to come and go in their lives, according to Dereef. The consistent presence of male role models inside the football program, to include some of its players, can be unusual for the area in which it operates, according to Dereef. “I try to talk to them about stuff they don’t see everyday– happily married, not cheating on the wife, fearing God and putting people of different races into their lives,” Dereef said. Students described their community as less fortunate and overlooked, but assure their situation gives them hope. Dereef and his staff are proud to be paving that road to success and breaking down misconceptions.